Nothing brightens a chilly winter day better than citrus flavor! 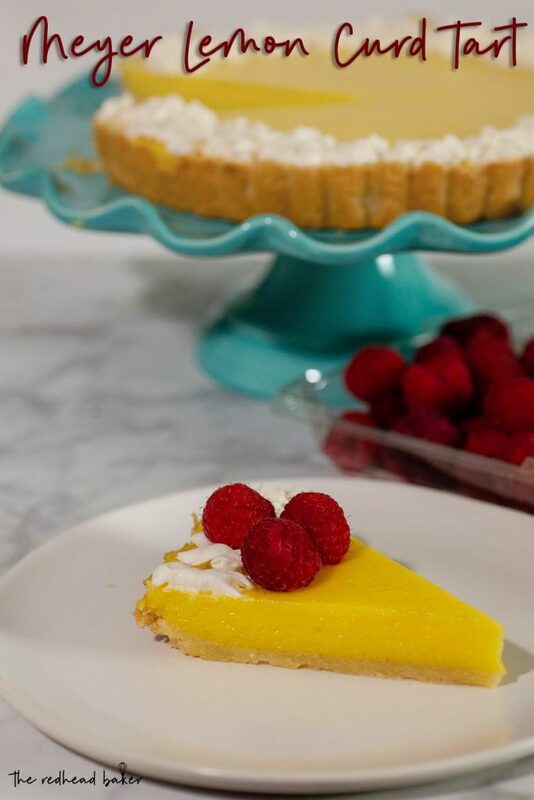 This meyer lemon curd tart has a buttery shortbread crust filled with sweet-tart curd made from meyer lemons. Christmas is over. Days are short. It’s cold. What’s there to look forward to? We’re not really into celebrating Valentine’s Day. We get each other cards, maybe some candy. I make a nice dinner. Well, here’s something to brighten your day. It’s a meyer lemon curd tart. Meyer lemons are a cross between oranges and lemons, and are a slightly sweeter than regular lemons. It starts with a very simple shortbread crust. I use a food processor to cut the butter into the flour/confectioners sugar/salt mixture. That’s pressed into a tart pan and baked. Then, the baked shell is filled with meyer lemon curd. Making citrus curd is very similar to making custard for an ice cream base. They’re both thickened with eggs and cooked over a double-boiler. The difference with curd is that it contains a much higher percentage of lemon juice, making the fruit flavor stronger. The filling is baked, and while the guideline is 15 minutes, know that it could take longer, depending on if your oven runs cool, or has cool spots. Just keep checking on the tart. Mine ended up taking closer to 25 minutes. This tart can be served at room temperature, but I prefer to serve it just slightly chilled, with a heavy dollop of whipped cream and a few fresh raspberries. This meyer lemon curd tart has a buttery shortbread crust filled with sweet-tart curd made from meyer lemons. Make the crust: Lightly butter, or spray with non-stick cooking spray, an 8- or 9-inch tart pan with a removeable bottom. Add the flour, sugar and salt to the bowl of a food processor. Pulse a few times to combine. Add the chilled butter, and pulse until the pastry starts to clump up. Transfer the pastry to the prepared tart pan and using clean fingertips, press the crust evenly onto the bottom and up the sides of the pan. Gently prick the pastry all over with the tines of a fork. Cover the crust in plastic wrap and place in the freezer for 15 minutes. Preheat the oven to 425 degrees. Remove the tart pan from the freezer and remove and discard the plastic wrap. Place the tart pan on a larger baking pan, and bake the shell for 1 3 to 15 minutes, just until the edges of the tart crust start to turn golden brown. Remove the tart pan from the baking sheet and place on a wire rack to cool. Lower the oven temperature to 325 degrees. Make the filling: bring about an inch of water to boil in a saucepan. Place a fine-mesh sieve over a medium mixing bowl and set near the stove-top. In a large mixing bowl, combine the egg yolks, egg, and sugar. Whisk vigorously until slightly thickened and lightened in color. Add the lemon juice, lemon zest, and salt. Place the mixing bowl on the saucepan of boiling water and whisk vigorously and constantly, until the mixture thickens and doubles in volume. Pour the curd through the fine-mesh sieve. Discard any solids in the sieve. Let the curd cool until warm to the touch, then whisk in the butter. Pour the curd into the cooled crust. Set the tart pan back on the baking sheet. Bake for 15 to 20 minutes, or until the custard is set (it is set when only the very center of the filling jiggles only slightly when the pan is gently shaken). Remove from the oven and place the tart pan on a wire rack to cool. The tart can be served at room temperature or chilled, garnished with whipped cream and fresh raspberries.